I was beginning to worry there for a moment, but Rocket Raccoon will return in his own comic book series again next year. Stupid awkward Marvel "reboot" thingy. About two comic lists back, there was some confusion about the top 100 bestsellers list Previews also runs, which are also covered in these lists, so from now on we'll try and explain that before just starting up a random list of titles from a month that isn't the actual month being previewed. That would begin this month, but there weren't enough furry titles to make the list to make it worthwhile. All This For a Snack? Comic books are getting silly again, or at least getting weird. Later this month DC Comics presents the premier issue of a new bi-monthly full-color series, Scooby-Doo Team-Up. Here’s what they say about it: “Rumors of a giant bat-creature bring Scooby and the gang on the run—but Batman and Robin are already on the trail of their old foe, the monstrous Man-Bat. Before long, the crooks behind a fake bat-creature will come face-to-face with the real thing…with the good guys caught in the middle!” Got that? It’s written by Sholly Fisch and illustrated by Dario Brizuela. 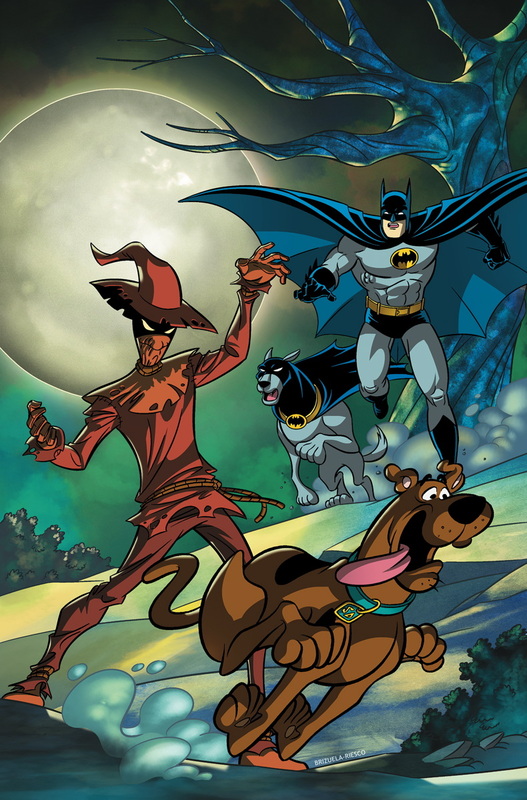 In the 2nd issue, Scooby-Doo teams up with Ace the Bat-Hound to fight the evil Scarecrow! Yes, really. Guardians of the Galaxy #3 (reviewed here) at 12. My Little Pony: Friendship is Magic garnered two spots on the February top-100 comic sales chart in this month; both issue #3 (which I wasn’t a fan of, but whatever) and the Twilight Sparkle Micro-Series issue (which I also wasn’t a fan of) made 45 and 62, respectively. Meanwhile, Adventure Time #13 lands at 95, where that series manages to land just about every time! Like last month, this month's best item is a big reprint book from Fantagraphics, this time two years of Pogo. Buy it buy it buy it. The Mickey Mouse hardbacks are impressive too. The diversity of sources continues. This includes some items from Kids Can Press, a Garfield thing from Papercutz, one from Toon Books, and a couple of Dragon Punchers from Top Shelf that I pass over as overjuvie. Man, there's hardly anything this month. I threw in the latest Girl Genius collection; I'm not sure if there's anything furry in it beside the robot dog, but it's the only thing in this month's post that I've ordered.